(seelamillA) AzhwAr who became bewildered out of infinite grief born out of separation from paramapurusha (supreme lord), awakening slightly after hearing bhagavAn’s divine names, unable to tolerate the grief of such separation, calls out for emperumAn saying “kANa vArAy” (come and see me, come to be seen by me). Meditating upon these aspects, AzhwAr mercifully explains the great longing which was born out his desire to enjoy such enjoyable emperumAn. thadhApi sUthEna … – SrI kausalyA cries out due to grief in separation of perumAL (SrI rAma), SrI sumanthra (minister/charioteer) consoled her saying “Don’t try to call him out in separation; he will himself be back”. sUthEna – When the charioteer [like krishNa who was the charioteer for arjuna and who assumed the role of gIthAchArya] says something, it must be considered trustworthy. suyukthavAdhinA – Even if one does not have full faith on the words of charioteer, he spoke very convincingly to eliminate the grief. nivAryamANA – Though he stops them from grieving. 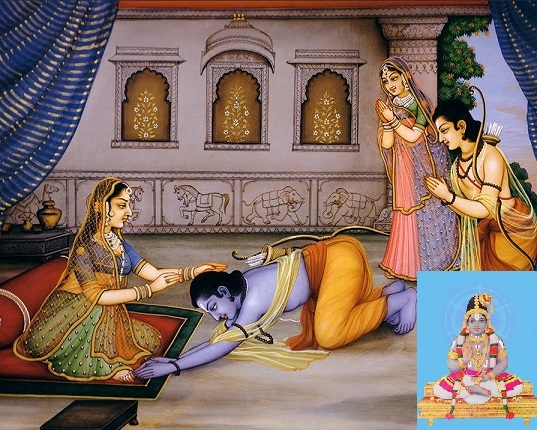 nachaivadhEvIvirarAmakUjithAth – Previously she eliminated others’ sufferings, and never having experienced sorrow, now she is crying out without break; she is crying out like a cuckoo, so that anyone hears that will feel pity for her. She called out saying “priyEthi puthrEthi cha rAgavEdhi cha” – Oh one who is so dear to me that I cannot bear your separation; Oh one who is the reliever of the suffering of those who are in separation from you; you being born in the clan of sarvarakshaka (protector of all), can you torture your own mother?. AzhwAr is now calling out for emperumAn like SrI kausalyA called out for SrI rAma. This entry was posted in thiruvAimozhi, thiruvAimozhi 4th centum on March 13, 2017 by Sarathy Thothathri.